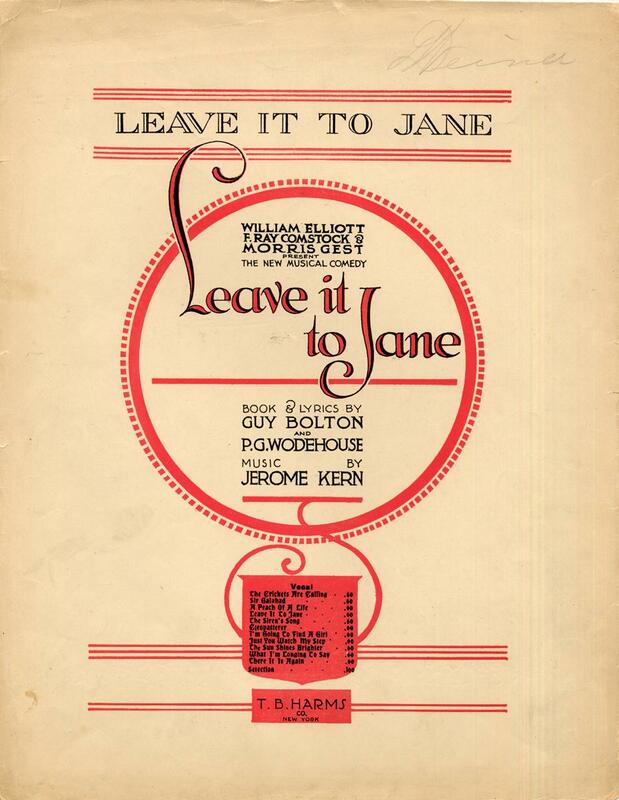 L Is For… LEAVE IT TO JANE (1917) | THAT'S ENTERTAINMENT! Regular readers may recall that I dedicated a July Wildcard Wednesday post to some of the early Princess Theatre (and several surrounding) scores written by Jerome Kern. As I wrote then, “…the renowned ‘Princess Theatre Shows,’ [were] a series of musicals that played, initially, at the Princess Theatre, and — for the most part — involved the creative team of Kern, librettist Guy Bolton, and lyricist/librettist P.G. Wodehouse. These musical comedies were known for their intimate designs, clever plots, and memorable scores. If I were a betting man, I’d say that, before 2014 is out, there’s a good chance we’ll be covering some of these Princess Theatre Shows on Musical Theatre Monday.” Well, my hunch was right, for today we’re covering one of the most fondly remembered of the bunch (despite not actually playing in the Princess Theatre), Leave It To Jane. Often cited as the seminal collegiate musical, or the ’10s answer to the ’20s’ Good News!, the ’30s’ Too Many Girls, and the ’40s’ Best Foot Forward (which involves high school kids, but contains many of the similar tropes), all of which have been covered on past Musical Theatre Mondays, Leave It To Jane also concerns a big game. This time it’s between rival schools, Atwater and Bingham. Our titular heroine is the popular daughter of Atwater’s president, and is called upon by her coupled friends Bessie and “Stub,” to seduce star halfback Billy Bolton (wonder where they got that surname?) away from his father’s alma mater, Bingham, and onto the team at Atwater, where they hope he’ll lead them to victory (and win a big bet for Stub). It’s a lot of fun. But even better than the coherent story? 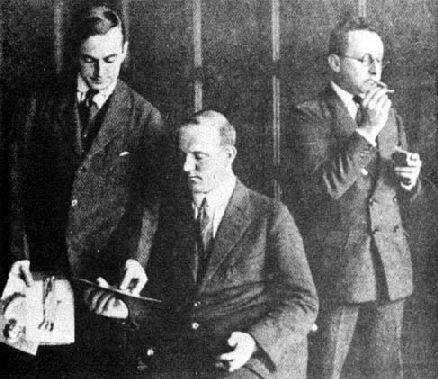 The wonderful Bolton-Wodehouse-Kern score, which contains more than its fair share of exciting tunes. The only complete and commercially available recording of the score is of the 1959 Off-Broadway Revival cast, which is the most prominent revival that the show has ever received. (There is also a live recording by the Comic Opera Guild, but it is not as widely attainable.) Though concerts of the songs, like one conducted by the irrepressible John McGlinn in 1985, happen occasionally (even last year at Musicals Tonight! ), the piece doesn’t get the play that I, and many other theatre aficionados, believe it deserves… especially since, as I mentioned above, the score is so good. Fortunately, I have obtained a complete studio recording of the score, conducted by McGlinn and starring the divine Rebecca Luker (in radiant voice, I might add), that was completed but never released. I should like to take the rest of the post to share tracks from this rare recording with you. The two numbers I shared in that July post were “Just You Watch My Step,” led by George Dvorsky as Stub, and “Cleopatterer,” a comic number for Flora Wiggins, the landlady’s daughter, voiced by Alix Korey. Below is Luker with Jane’s opening number, “Wait Till Tomorrow,” and above is the effervescent title song. Another fun one, this is “I’m Going To Find A Girl (Someday),” sung by Stub, Bub, Ollie, Louella, Marion, and Cissie. Ever see a production of Leave It To Jane? I’d love to hear about it. Subscribe and comment below! Come back next Monday for M! And tune in tomorrow for the best from the final season of The Mary Tyler Moore Show!